MANILA, Philippines – The official results and list of passers for the Civil Service Exam CSE March 2019 Subprofessional Level in the National Capital Region (NCR) or Metro Manila are expected to be released by the Civil Service Commission (CSC) within 60 days after the administration of exams. CSE 2019 official results will also include the top 10 passers for professional and subprofessional levels as well as important announcements on claiming the CoE for successful examinees. The eligibility exams for both prof and subprof levels were conducted on March 17, 2019 (Sunday) at all CSC Regional testing centers nationwide. 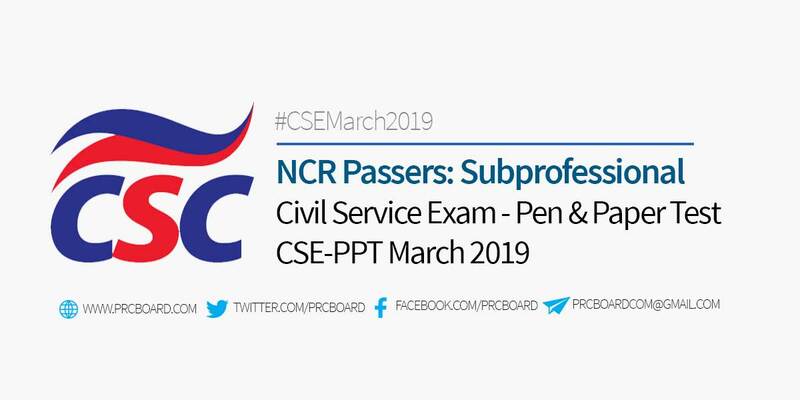 Below is the complete list of passers for March 2019 Civil Service Exam CSE - Subprofessional level in the National Capital Region - NCR (Region 13), courtesy of CSC. CSE-PPT for professional and subprofessional levels are conducted twice a year to cater the growing number of individuals who wish to serve in Philippine government. Meanwhile, CSC is also scheduling special CSE-PPT exams for those already working in the government without eligibility certification. For those who will fail to pass the exams or failed to take the recent CSE can take the next schedule of CSE for this year. For details, kindly refer to the article below. To receive updates on any announcements about March 2019 Civil Service exam results, we advise our readers to bookmark this page, visit CSC official website or follow us at our social media pages via Facebook and Twitter.